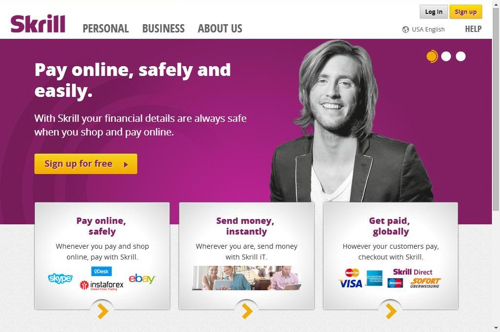 Scrill or Moneybookers is an internationally operating payment processor which has its headquarters in London. It has been around since 2002 and currently has over 15 million active customers. People use Scrill to transfer funds to friends and relatives, shop online, and of course make payments from and to the growing number of Scrill casinos. To get started with Scrill you first need to register an account. This is simple and free of charge. Setting up an account only takes a few minutes. As Moneybookers functions as an e-Wallet the next step is funding it. You can deposit funds to your Scrill account using a credit card, an international bank transfer, or 1 of the more than 100 local payment methods. Credit card payments are processed instantly, but are charged with a 1.9% fee. Bank transfers usually take between 2 to 5 business days and are free of charge. For some countries deposing with a check is possible, this is free but can take up to 10 business days. The large number of local payment options offer “locals” cheap (usually free) ways to instantly deposit funds to Moneybookers. When you made your choice and funded your account, you are ready to deposit at one of the Moneybookers casinos listed below here. All you need to make a deposit at your favorite Scrill casino is the e-mail address and password you registered. You will be directed to the Scrill site to complete the transaction, and the funds will arrive on your casino account shortly thereafter. Both depositing and withdrawing funds from and to Scrill casinos is free of any charge. A great thing about Scrill is that if a casino offers it as a deposit option, you can almost always also use it to withdraw funds. Usually it takes 1 to 2 business days for withdrawals to be processed from the casino to your Scrill account. Once the money is back in your e-Wallet – depending on the country you live in – you have a number of different options to get hold of your money. International bank transfers are available for every country and have a fixed fee of €1.80 (about $2.60). The same goes for checks but these have a fixed fee of €3.50 (about $5.10). For some countries (US not included) withdrawals can be made to your Visa card for a €1.80 fixed fee.